Remove an overseas funds transfer recipient easily using digibank. 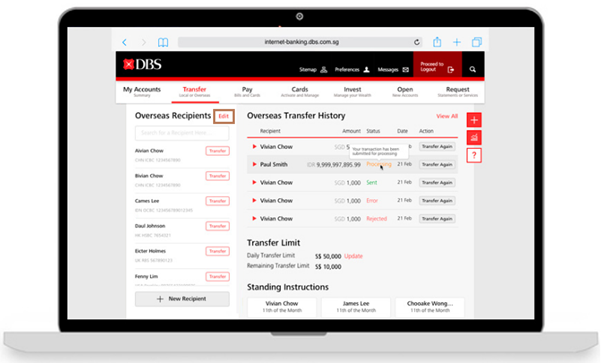 Select Transfer and click on DBS Remit and Overseas Transfer. Beside Overseas Recipient click All. Select the recipient(s) you wish to delete by indicating a tick beside the Recipient's Name. Verify the details and click Submit to delete recipient(s). Click To Other SG/Overseas Payees. Click the button on the right of the recipient you wish to delete.